Routine health information systems are critical for monitoring service delivery. 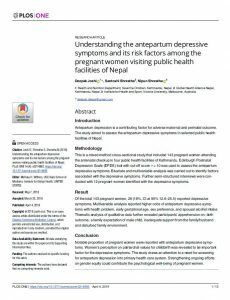 District Heath Information System, version 2 (DHIS2) is an open source software platform used in more than 60 countries, on which global initiatives increasingly rely for such monitoring. 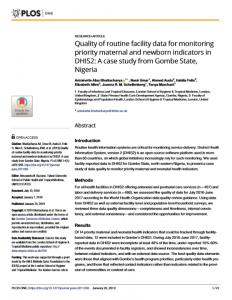 We used facility-reported data in DHIS2 for Gombe State, north-eastern Nigeria, to present a case study of data quality to monitor priority maternal and neonatal health indicators. 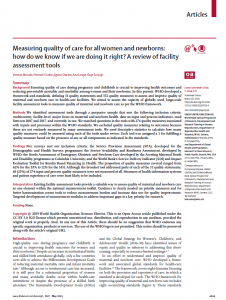 For all health facilities in DHIS2 offering antenatal and postnatal care services (n = 497) and labor and delivery services (n = 486), we assessed the quality of data for July 2016-June 2017 according to the World Health Organization data quality review guidance. Using data from DHIS2 as well as external facility-level and population-level household surveys, we reviewed three data quality dimensions—completeness and timeliness, internal consistency, and external consistency—and considered the opportunities for improvement. 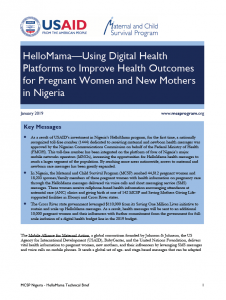 Of 14 priority maternal and neonatal health indicators that could be tracked through facilitybased data, 12 were included in Gombe’s DHIS2. During July 2016-June 2017, facilityreported data in DHIS2 were incomplete at least 40% of the time, under-reported 10%-60% of the events documented in facility registers, and showed inconsistencies over time, between related indicators, and with an external data source. 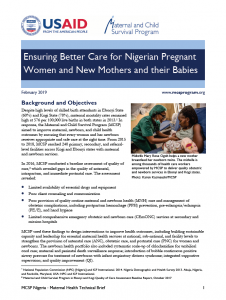 The best quality data elements were those that aligned with Gombe’s health program priorities, particularly older health programs, and those that reflected contact indicators rather than indicators related to the provision of commodities or content of care. 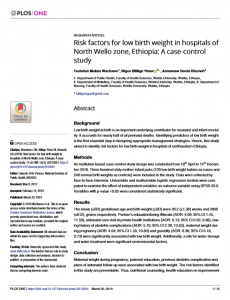 This case study from Gombe State, Nigeria, demonstrates the high potential for effective monitoring of maternal and neonatal health using DHIS2. However, coordinated action at multiple levels of the health system is needed to maximize reporting of existing data; rationalize data flow; routinize data quality review, feedback, and supervision; and ensure ongoing maintenance of DHIS2.